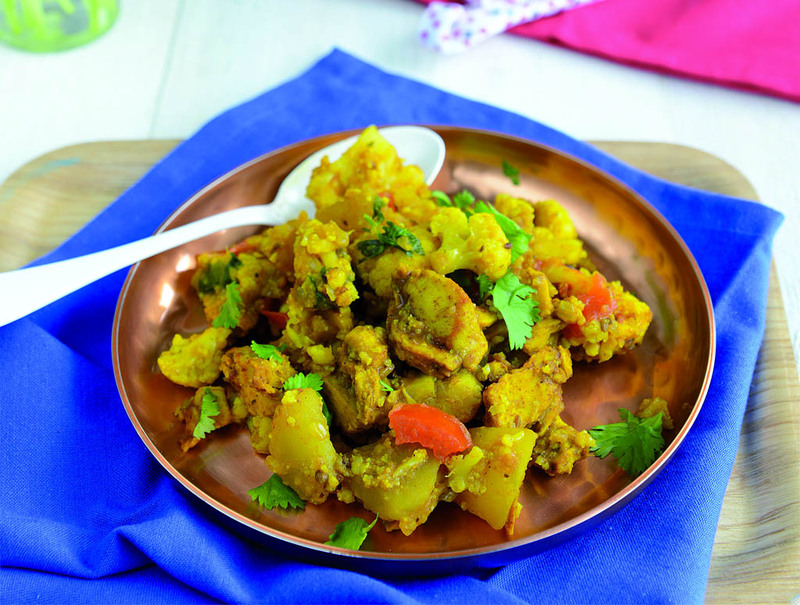 Aloo Gobi is a typical Indian dish with cauliflower, potatoes and a tasty mixture of different spices. Cut the cauliflower into small florets, the potatoes into cubes. Peel the onions, garlic cloves and the ginger and chop finely. Remove the stalk from the tomatoes and cut into medium-sized pieces. Let the coconut oil melt in a casserole. Coarsely chop up the coriander and cumin in a mortar and briefly braise. After about a minute add the chopped onion and then the garlic, ginger, curry and curcuma. Mix thoroughly. Add the potato cubes and mix well. Add salt, pepper and 200 ml of water and let the food simmer (at low heat) with the lid on for about 15 minutes. Stir regularly. Then add the diced tomatoes and the tomato puree after about 12 minutes, mix again. Then add some chopped coriander and the VEGANKEBAB Curry. When done, season and serve hot.